Should tumor depth be included in prognostication of soft tissue sarcoma? Most staging systems for soft tissue sarcoma are based on histologic malignancy-grade, tumor size and tumor depth. These factors are generally dichotomized, size at 5 cm. We believe it is unlikely that tumor depth per se should influence a tumor's metastatic capability. 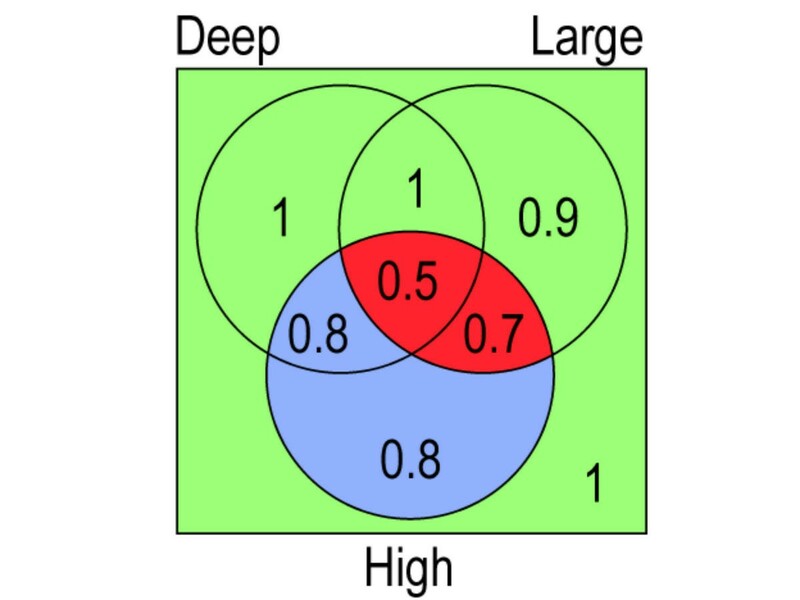 Therefore we hypothesized that the unfavourable prognostic importance of depth could be explained by the close association between size and depth, deep-seated tumors on average being larger than the superficial ones. When tumor size is dichotomized, this effect should be most pronounced in the large size (>5 cm) group in which the size span is larger. We analyzed the associations between tumor size and depth and the prognostic importance of grade, size and depth in a population-based series of 490 adult patients with soft tissue sarcoma of the extremity or trunk wall with complete, 4.5 years minimum, follow-up. Multivariate analysis showed no major prognostic effect of tumor depth when grade and size were taken into account. The mean size of small tumors was the same whether superficial or deep but the mean size of large and deep-seated tumors were one third larger than that of large but superficial tumors. Tumor depth influenced the prognosis in the subset of high-grade and large tumors. In this subset deep-seated tumors had poorer survival rate than superficial tumors, which could be explained by the larger mean size of the deep-seated tumors. Most of the prognostic value of tumor depth in soft tissue sarcomas of the extremity or trunk wall can be explained by the association between tumor size and depth. Most staging systems for soft tissue sarcoma are based on histologic malignancy grade, tumor size and tumor depth (the French (FNCLCC) system ; the Memorial Sloan Kettering (MSK) system ; the American Joint Committee on Cancer/International Union Against Cancer AJCC/UICC system 5th ed . However, we think it is unlikely that tumor depth per se, all other things being equal, should influence the risk of metastatic spread from a soft tissue sarcoma. One explanation for the prognostic value of tumor depth could be the association between depth and tumor size, deep-seated tumors being larger. Most systems dichotomize size at 5 cm. Prognostic information from tumor depth may be obtained if each size group (1–5/>5 cm) is divided into superficial and deep-seated tumors if the mean size of the deep-seated tumors is larger than that of the superficial tumors. A prognostic effect of tumor depth could then be related to size and should be strongest in the large size group in which the size span is greater. We tested this hypothesis in a large population-based series of soft tissue sarcoma of the extremity and trunk wall in adults. The southern Sweden soft tissue sarcoma database is population-based, i.e. all patients diagnosed with a soft tissue sarcoma within a defined geographical region (currently 1.5 million inhabitants) are included, irrespective of whether treated at our sarcoma center in Lund or at other hospitals in the region. Patients not referred to our center are identified via the Regional Tumor Registry. All patients with malignant tumors are reported to this Registry by a double-reporting system: every clinician and every pathologist who diagnoses a malignant tumor is obliged to report to the registry. For patients not referred to out sarcoma center, clinical data are obtained from the medical records and archived tumor material is reviewed by our center pathologists. The database includes all adult patients with a soft tissue sarcoma in the extremity or trunk wall. Strictly cutaneous sarcomas (most of them small leiomyosarcomas of the skin which almost never metastazise), dermatofibrosarcoma protuberans, syndrome-related sarcomas (e.g. sarcomas in patients with neurofibromatosis) and radiation induced sarcomas are not included. For a detailed description of the database, see Gustafson . During the 25-year period 1973–1997, 578 patients were included. 44 patients who had metastases demonstrated already at diagnosis of the primary tumor and 44 patients who had had tumors that were not at least marginally excised were excluded, which left 490 patients for this study. 300 were referred to our tumor center before surgery (half of them after needle biopsy), 127 immediately after surgery (most often marginal excision of small and superficial tumors), 21 first after local recurrence, and 42 patients were not referred at all. 90 patients were given local radiotherapy (most often postoperatively) and 34 patients were given adjuvant chemotherapy for the primary tumor according to several regimens. These patients were not separately analyzed; local radiotherapy influences mainly the local recurrence rate and the chemotherapy used has no major effect on distant metastases. The mean age at diagnosis was 62 (17–94) years. 52 % of the patients were men. Nine tenths of the tumors were located in the extremities, almost half of them in the thigh and hip girdle. Two thirds (321/490) of the tumors were deep-seated. The mean size was 8.3 cm for deep-seated tumors and 5,2 cm for superficial tumors. Two thirds of the tumors (325/490) were larger than 5 cm. Malignant fibrous histiocytoma (219) was the commonest histotype (most of these tumors were diagnosed in the 1980's) followed by leiomyosarcoma (73), liposarcoma (54), synovial sarcoma (38) and malignant peripheral nerve sheath tumors (18). The tumors were malignancy-graded on a 4-tiered scale with decreasing survival rates associated with increasing grade. Most staging systems dichotomize grade but the definition of low and high malignancy grade is not clear-cut. Therefore, we used two alternative dichotomizations being: grades I and II versus grades III and IV and grades I-III versus grade IV (Table 1). Survival according to histologic grade. Follow-up was complete for a minimum of 4.5 years or until death. The median follow-up time for the survivors was 11 (min 4.5, max 26) years. During the observation period 151 patients developed metastatic disease, 122 of these have died because of tumor. Local recurrence occurred in 55/300 (18%) of patients referred before surgery and in 64/190 (34%) patients referred after surgery or not referred for the primary tumor. Tumors superficial to the deep fascia are called superficial, all others are called deep. Small tumors are 5 cm or less in largest diameter, all other tumors are called large. High grade refers to either grades III-IV tumors or grade IV tumors as indicated in text. Survival was analyzed in terms of metastasis-free survival; death and other metastasis-free causes for ending follow-up were treated as censoring. Presented rates indicate 5-year metastasis-free survival and were calculated using the Kaplan-Meier method. Multiple prognostic factors were analyzed simultaneously using Cox's proportional hazards model. The statistical analyses were performed by Jonas Ranstam, PhD, CStat, Lund, Sweden. Abbreviations in the Tables: RR relative risk, CI confidence interval. In the small (1–5 cm) tumor group the mean tumor size was similar for superficial and deep tumors. However, in the large (>5 cm) tumor group the mean size of deep tumors was one third larger than that of superficial tumors. The findings were almost identical if only high grade tumors (irrespective of the classification of high-grade) were analyzed (data not shown). Multivariate analysis of size, depth, and grade (dichotomized in two ways) showed size and grade to be of independent prognostic value, irrespective of definition of high grade. When size and grade were taken into account, depth had no major effect on survival, neither in the total series nor when separately analyzed in MFH, leiomyosarcoma, liposarcoma, synovial sarcoma, and the remaining histotypes as one group (data not shown). Venn diagram showing approximate 5-yr metastasis-free survival rates in the 8 combinations of depth, size and grade (high=III-IV). For exact survival rates see Table 4. Green fields include the four subsets of low grade tumors. The survival rates are between 1 and 0.9 irrespective of depth and size. Blue fields include the two subsets of small high grade tumors, both with survival rates of 0.8. Red fields include the two subsets of large and high grade tumors. The survival rates differ, being 0.7 for superficial tumors and 0,5 for deep tumors. The explanation is that the mean size of deep-seated, large tumors is greater than that of superficial, large tumors, see Table 2. The principal findings are the same when high grade is defined as grade IV, see Table 5. The survival rate for small and low (I-II or I-III) grade tumors was similar whether the tumor was superficial or deep. Likewise, the survival rate for small and high (III-IV or IV) grade tumors was similar whether the tumor was superficial or deep. However, for large and high grade tumors the survival rate was lower for deep than superficial tumors. These observations were the same irrespective of how grade was dichotomized. Staging by grade (high grades = III-IV) and tumor size trichotomized. Staging by grade (high grade = IV) and tumor size trichotomized. After finding that depth had no major prognostic value we assessed staging based on only grade (low, high (III-IV or IV)) and size. We categorized size in 3 groups, 1–5 cm, 6–10 cm, and larger than 10 cm. We found that a 4 tiered staging system led to decreasing survival with increasing stage with good separation of the survival rate between the stages. We made the same observations irrespective of how grade was dichotomized. Many staging systems for soft tissue sarcomas of the extremity and trunk wall have been proposed but none is generally accepted. One reason may be that it is impossible to create a system common for all entities of soft tissue sarcoma since prognostic factors vary regarding type and strength between histotypes . Our aim with this study was not to suggest a new staging system but to analyze the rationale for using tumor depth as a prognostic factor. Histologic malignancy-grade and tumor size are undisputed strong prognostic factors in soft tissue sarcoma and are consequently included in all staging systems, most of which also include tumor depth. However, there is a well-known association between tumor depth and size and some authors have found similar survival in patients with superficial and deep tumors when stratified according to grade and size [5, 6]. The largest prognostic study on soft tissue sarcoma hitherto published, based on 2,136 patients treated at the Memorial Sloan-Kettering Cancer Center, showed that both size and depth were of prognostic importance . That study included one fifth retrointraabdominal and visceral tumors which all by definition are deep-seated and with a poor prognosis, sometimes killing the patient because of uncontrollable local growth despite being low grade without metastatic spread. This may, at least in part, explain the independent prognostic value of depth. Recently two other large studies on staging of soft tissue sarcoma arrived at different conclusions: Wunder et al  found that a system utilizing grade, depth, and size (all factors dichotomized) would better predict patient outcome and stratify risk than one using only grade and size whereas Ramanathan et al  proposed a staging system based on only grade and 4 groups of size. We find it less probable that whether a sarcoma arises and grows in or outside the deep fascia investing the extremities and trunk wall should influence the metastatic process – tumor growth into blood vessels with release of tumor cells into the circulation followed by adherence and growth of these tumor cells in their new environment. One explanation for a prognostic importance of tumor depth that we have explored could be that certain histotypes are predominantly deep-seated and that these specific histotypes are more prone to metastasize even when adjusted for size and grade. We could not find that this was an explanation for the prognostic importance of depth. Indeed the fraction of deep-seated tumors and the prognostic strength of high malignancy-grade varied between histotypes, however, leiomyosarcoma was the histotype with the highest fraction superficial tumors (even though skin leiomyosarcomas were not included) but also the histotype that had the highest relative risk for metastatic disease associated with high malignancy-grade (data not shown). We therefore chose to closer analyze the relation between size and depth of tumors. Most staging systems dichotomize tumor size (largest diameter) in 1–5 cm/>5 cm. The 5 cm designation sometimes seems arbitrarily chosen, perhaps based on praxis rather than updated analyses. When different size thresholds have been tested to distinguish patients with poor and good prognosis, 6 cm , 8 cm  and 10 cm  have been used. Probably each increase of size increases the risk for metastatic spread. Trovik et al  found that the relative risk for metastatic disease increased by 1.5 per 5 cm increment of tumor size. Suit et al  studied 6 groups of size and found an increasing risk of metastases with increasing size. We made the same observation. We also found that when size is dichotomized at 5 cm, the mean size of small tumors (1–5 cm) is the same irrespective of whether the tumor is superficial or deep. However, in the large tumor group (>5 cm) the size of deep tumors were one third greater than that of superficial tumors. This seems to explain the prognostic value of depth when size is dichotomized at 5 cm. This prognostic effect of tumor depth was evident only in large and high-grade tumors where the deep-seated tumors had the poorest prognosis (Figure). Although we observed the effect only in large and high-grade tumors this subset comprises about one half of all tumors (Tables 4,5,6,7). The reason that we could not find any prognostic importance of tumor depth in large but low-grade tumors is probably the good prognosis for low-grade tumors. In conclusion, we found no evidence of tumor depth being a major prognostic factor for metastatic disease in soft tissue sarcoma of the extremity and trunk wall. Only when tumor size is dichotomized at 5 cm does depth contribute prognostic information. We suggest it is conceptually better to disregard depth and optimize the information from size by using more than two size categories.